To Sum It Up: Poor Alexia never expected to find herself embroiled in a scandal that’s the subject of all of the London gossip columns, but that’s exactly what has happened to her. There’s also the slightly more pressing matter of some vampires who want to kill her. No longer safe in England, Alexia heads to Italy, but the danger that awaits her there may be even worse than the one she’s fleeing from. Review: Well, I've reached the midway point in this simply wonderful series, and it continues to be a most addictive read. 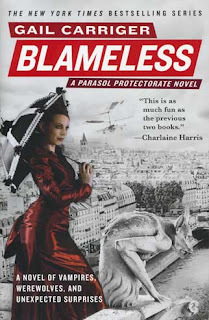 Book #1, Soulless, still reigns as my favorite thanks to all of the verbal sparks between Alexia and Lord Maccon, but there's still so, so much to love about Blameless. Alexia can't seem to go anywhere without someone trying to kill her, not even when she makes a thrill-packed flight from England that takes her and her companions, Madame Lefoux and Floote, through France and on to Italy. There's hardly ever a lull in the action in Blameless, and although the danger that Alexia is in is very grave indeed, she handles it with her usual logic and aplomb. As long as there's tea available. I really, really felt for Alexia in this one because she's not only dealing with murderers highly intent on their mission, but she's also trying to put on a brave face despite a broken heart. I love Lord Maccon lots, but I went into Blameless pretty steamed at the Earl of Woolsey because of some things that happened in Changeless. He has some serious remorse in Blameless, and the way he expresses it—well, in keeping with the humor of the series, I wanted to laugh. With Lord Maccon, ahem, indisposed, Professor Lyall gets a significant turn in the spotlight, stepping in to attempt to keep the increasingly restless Woolsey pack in line. The good professor has been a favorite character from the beginning of the series, and he's utterly brilliant, and not just in mind, in Blameless. It's thanks to him that the earl continues to have a pack to lead, and while Lyall always treats his Alpha with all due respect, he also isn't afraid to stand up to Lord Maccon's bluster when necessary. Blameless also gives Floote a few opportunities to shine, showing off what a badass he can be. Yes, I just used "Floote" and "badass" in the same sentence. Believe me, there's so much more lurking beneath that stoic exterior. And I love how Gail Carriger makes the most of his dialogue; Floote is a man of few words, but they never fail to be wit-tastic. As much as I chuckled out loud while reading Blameless, I think this one was just a tad more serious in places than its predecessors. I was particularly struck by what happens to one of my favorite secondary characters. Don't fear that the series has departed too far from its signature humor, however, because it's still present in droves. Just try not to snicker at the thought of Ivy, with her atrocious taste in hats, being charged with running Madame Lefoux's millinery shop in the latter's absence! All in All: I am well and truly addicted to this series. On to Alexia's next adventure! I will have to add this to my Sunday calendar because Prudence is just around the corner! I just pre-ordered Prudence the other day- can't wait!!! Anything Sunday (3): Pen and Paper Rock!